When decorating for the holidays, like most people, you probably get out the twinkly lights and decorations. Before you do though, it's important to make sure that those lights are safe to use. Most homeowners don't realize, but there is a big difference between lighting that is rated for indoor use and lights rated for outdoor use. Lights rated for outdoor use, for example, are permitted to get much hotter than lights intended for indoor use. Likewise, lights intended for indoor use are not designed to protect against rain and snow. As this can be a Fire hazard, lights should only be used for their intended purpose. 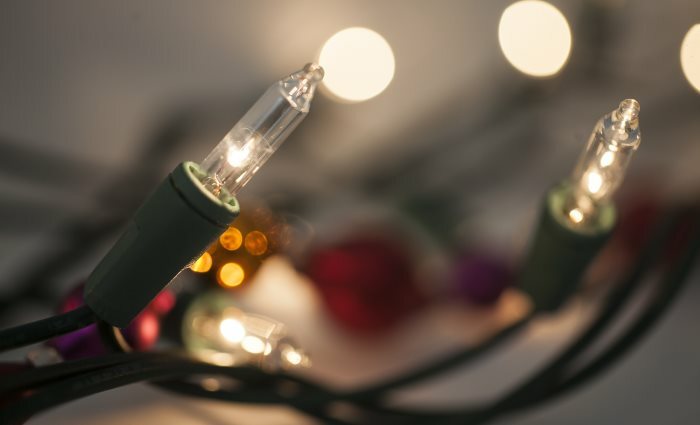 When unboxing your lights, inspect each strand for frayed or bare wires, cracked sockets, or loose connections. Throw away any lights that show any signs of damage. When purchasing light strings, extension cords, or timers, ensure that they have been certified by an accredited certification organization such as CSA International or Underwriters Laboratory (UL). Light string manufacturers will specify a maximum number of light strings that can be connected together safely. Never exceed the recommendations for your lights (for most lights this is 3 light strands), and never plug other things into your light strings. LED Christmas Lights use about 10% of the electricity that incandescent bulbs use, and also produce far less heat (which reduces the chance of fire). While early LED bulbs where known for having a "blue hue", the technology has improved significantly, making this less of an issue now. LED bulbs also last much longer than your average incandescent bulb. Incandescent Christmas Lights are loved by traditionalists, and generate a "warmer" light. While they use more electricity, they also tend to be brighter than LED bulbs. This also means that they produce more heat and can pose a greater fire risk. Now that you've picked out the perfect light strings and have your house decorated, we know the last thing you want to do is turn the lights off. As pretty as those lights are though, safety is always a priority. This is why the National Fire Protection Association (NFPA) recommends turning off your lights when you go to bed or whenever you're not home. We hope you found this information helpful and that everyone has a happy holiday season! As always, should you ever have a need for any of our services, please don't hesitate to Contact Us! *This story originally appeared in the December 2017 issue of Connections Magazine, as part of a monthly contribution made by Disaster Blaster, Inc. Please check out the current issue of Connections Magazine for this month's story!